Gene Simmons has always boasted that Edward Van Halen asked if he could join Kiss in 1982. This crazy-sounding rumor has always baffled many. Would Eddie really want to join KISS at the time Van Halen’s fame was skyrocketing and Kiss’s fame was waning? In the new issue of Guitar World magazine (April 2014), Kiss guitarist Paul Stanley and bassist Gene Simmons celebrate their upcoming Rock and Roll Hall of Fame induction with a pair of revealing interviews about their 40 years in Kiss. Guitar World was sure to ask both Gene and Paul about this Van Halen rumor during their separate interviews. Guitar World: There have always been rumors that around the time of Creatures of the Night, Eddie Van Halen had asked to join Kiss. Paul Stanley: I never heard that. Eddie did come down to the studio during Creatures, and he spoke to me on the phone during that period. There was real dissension in the band at that time, that much was clear. But as far as I’m wanting to join Kiss? No, not that I know about. Doesn’t mean it didn’t happen, but I never heard it. But you have two interviews here. 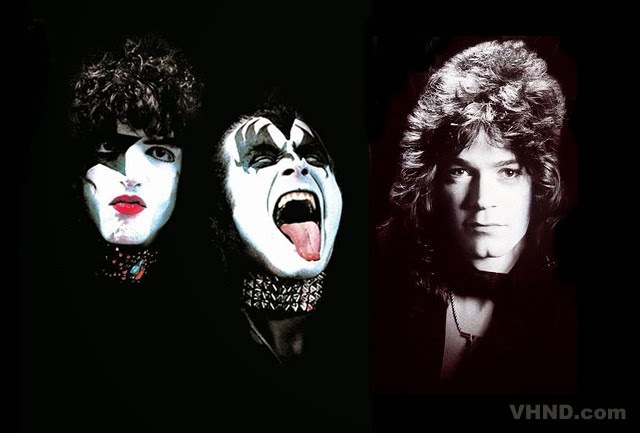 Guitar World: Speaking of all the guitarists who passed through Kiss’ ranks in the ’80s, is it true that Eddie Van Halen wanted to join the band around the time of Creatures of the Night? Gene Simmons: That is true. And he was very serious. He was so unhappy about how he and [David Lee] Roth were – or weren’t – getting along. He couldn’t stand him. And drugs were rampant. And so he took me to lunch, to a diner right across the street from the Record Plant. Vinnie Vincent, who was not yet in Kiss, tagged along, too. Sneaky guy. And Eddie said, “I want to join kiss. I don’t want to fight anymore with Roth. I’m sick and tired of it. ” But I told him, “Eddie, there’s not enough room. You need to be in a band where you can direct the music. You’re not going to be happy in Kiss.” I talked him out of it. It didn’t fit. Guitar World: If Eddie had joined at that time, he would have been in makeup. Gene Simmons: Yes. But he was about the same size as Vinnie Vincent. Little guy. Is Gene making a bigger deal out of it then it was? Was Eddie dead serious, or did he just want a shoulder to cry on? If Gene said yes, would Ed have really left his band? It’s hard for us to imagine. 1) Gene flew Van Halen to New York City and produced a demo of 10 songs for the band. He tried to help them get a record deal. and “Tunnel Of Love.” A three-track recording exists, but remains unreleased and uncirculated. 3) Before Van Halen was signed, Gene repeatedly tried to recruit Eddie for Kiss (just the opposite of what Gene says happened in 1982). This was expanded upon by David Lee Roth in his autobiography (here), and by Wally “Cartoon” Olney, a close friend of the band’s in the early days (here).